Almost everyone uses cotton swabs. I use them in my work, as they are fantastic tools for spot touch-ups or gentle smudging during makeup application. I go through a lot of swabs, so I buy organic. 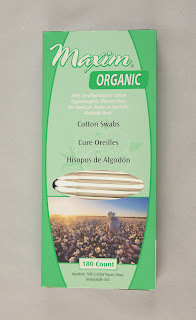 Next time you buy swabs, I recommend looking for an organic brand such as Maxim organic cotton swabs. Maxim's organic cotton swabs are a fantastic, eco-friendly alternative to conventional swabs. They are biodegradable, bleached with hydrogen peroxide instead of chlorine, and are even made without tree cellulose to help preserve forests. They are about as sustainable as cotton swabs can get! I highly recommend them for anyone looking for an eco-friendly swab.